The Pound has been under negative pressures again in early April, with little progress made politically on the Brexit negotiations within the UK since the 29th March deadline was extended. Another new deadline looms this week, Friday April 10th, with strong rhetoric from within the EU seeing risks of a “no deal” Brexit increase again, which has assisted in pushing Sterling lower. US Dollar resilience across many currencies has added to the negative tone for the GBPUSD FX rate, which we focus on here. A Friday selloff as expected through 1.3059 and 1.3012 supports, with a modest rebound effort failing back from just below our 1.3130 resistance (from 1.3122), to reinforce Thursday’s plunge, keeping risks lower for Monday. We see a downside bias for 1.2985 and 1.2976; break here aims for key 1.2947, maybe 1.2890. 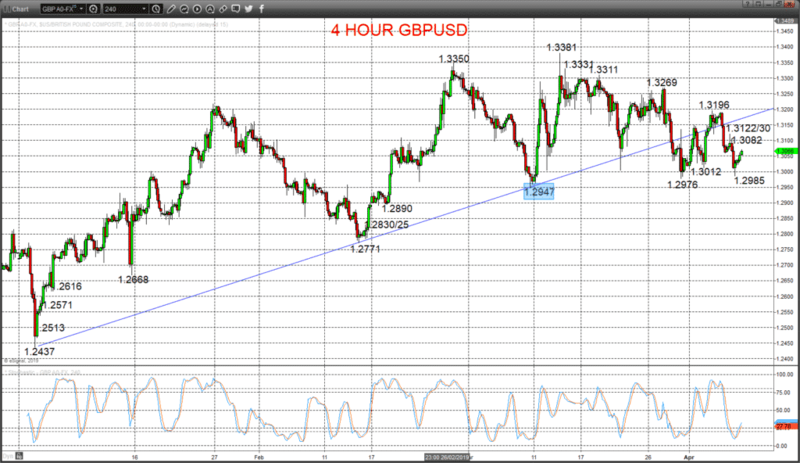 But above 1.3082 opens risk up to 1.3122/20, maybe towards 1.3196.